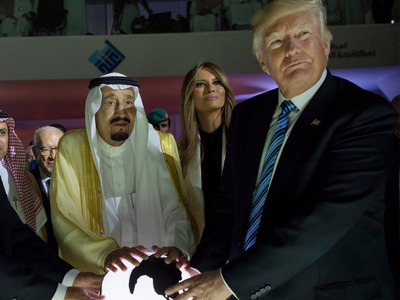 Saudi Press AgencySaudi King Salman with President Donald Trump and the US first lady, Melania Trump, at a new Global Center for Combating Extremist Ideology in Riyadh, Saudi Arabia. Turkish President Recep Tayyip Erdogan on Tuesday suggested the Saudis might have covered up a murder in their Istanbul consulate, a dramatic new twist in the case of the missing journalist Jamal Khashoggi. Investigators on Monday were allowed access to the Saudi Consulate in Istanbul, where Turkey has said a hit team of 15 killed and dismembered Khashoggi. Erdogan said investigators found surfaces newly painted over, which could indicate an attempt to conceal evidence. President Donald Trump on Monday said he talked to Saudi King Salman and had begun leaning toward the idea that “rogue killers,” not agents of the Saudi state, killed Khashoggi. Under increasing international pressure, Saudi Arabia is reportedly trying to piece together an alibi over Khashoggi’s disappearance. While US Secretary of State Mike Pompeo was meeting with Saudi Arabia’s leaders on Tuesday, Turkish President Recep Tayyip Erdogan dropped a bombshell of a new twist in the investigation into the mysterious disappearance of the Saudi journalist Jamal Khashoggi. According to Erdogan, Turkish investigators who searched the Saudi Consulate in Istanbul found surfaces there newly painted over. Previous news reports have cited anonymous Turkish officials suggesting that a hit team of 15 Saudis killed and dismembered Khashoggi, a critic of the Saudi government, inside the consulate. “My hope is that we can reach conclusions that will give us a reasonable opinion as soon as possible, because the investigation is looking into many things such as toxic materials and those materials being removed by painting them over,” Erdogan told reporters, according to the Turkish pro-Erdogan website Yeni Safak. Turkish investigators acknowledged that searching the consulate 13 days after Khashoggi vanished wasn’t ideal. As part of the search, they used a dog and took soil samples as well as a metal door from the garden, according to Reuters. Turkish officials have also been quoted saying they have audio recording Khashoggi being killed. The New York Times on Monday reported that Saudi Arabia had begun preparing an alibi that would acknowledge Khashoggi had been killed. Publicly, Saudi Arabia so far has issued only denials in response to reports of Turkish claims that Khashoggi was murdered. 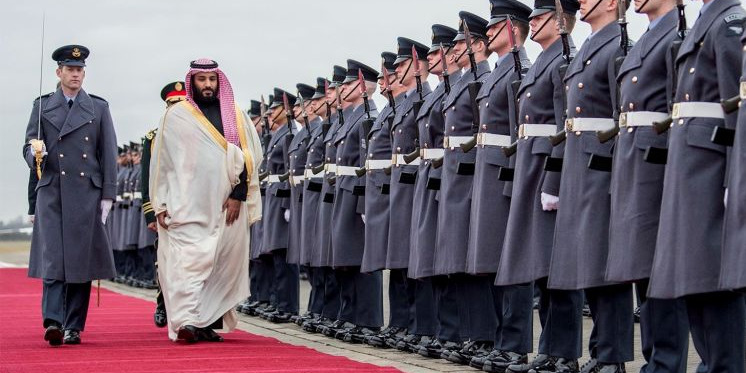 The Times cited sources as saying the Saudis were planning to say Khashoggi had been killed in an “interrogation gone wrong,” done without the monarchy’s knowledge. After a phone call with Saudi King Salman on Monday, President Donald Trump suggested that “rogue killers” might be responsible for the disappearance, rather than the Saudi royalty. He accused Trump of having been enlisted as Saudi Arabia’s “PR agent” to float the denial. Bandar Algaloud / Saudi Kingdom Council / Handout/Anadolu Agency/Getty ImagesSaudi Crown Prince Mohammed bin Salman at an official welcoming ceremony in London on March 9. In an interview that aired Sunday night, Trump threatened “severe punishment” if it turned out the Saudis did kill Khashoggi, who had been living in the US in self-imposed exile. But he has also repeatedly backed off the idea of halting arms sales to Saudi Arabia and emphasised that Khashoggi is not a US citizen. Still, Saudi Arabia responded harshly, saying it would retaliate and escalate the situation if it suffered any consequences from the Khashoggi case. 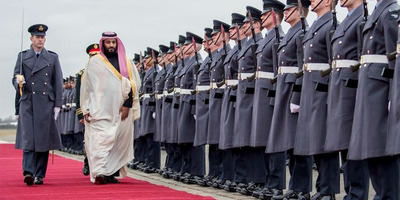 Harsh responses to any gentle criticism or genuine questions have become a hallmark of Saudi foreign policy under Crown Prince Mohammed bin Salman, the de facto Saudi leader who is set to inherit the throne from his father, King Salman. Saudi Arabia has found itself becoming isolated since Khashoggi vanished on its property in Istanbul, with business executives and companies increasingly distancing themselves from the kingdom. “This is going to alter the relationship between the US and Saudi Arabia for the foreseeable future,” Sen. Marco Rubio of Florida said on CNN, joining a growing chorus of senators who now want to investigate and who seem willing to sanction the kingdom over the boiling controversy. On Tuesday, Pompeo landed in Riyadh to meet with King Salman to discuss Khashoggi’s disappearance. CNN reporters covering the meeting say it lasted no longer than 15 minutes. While Trump and the Saudis appear on the same page about “rogue killers,” Erdogan reminded observers on Tuesday that Turkey remained in control of the facts of the case as its investigators continued to uncover potentially damning information.